At the 2018 Olivier Awards, held in massive Royal Albert Hall, it was no surprise that Hamilton and Angels in America scored big. The musical captured seven of its record 13 nominations. Outstanding Achievement in Music: Miranda and orchestrator Alex Lacamoire, Hamilton. 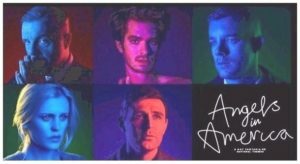 Revival, Play: Royal National Theatre’s Angels in America, Parts One and Two, Tony Kushner [now on Broadway with the original stars Andrew Garfield and Nathan Lane]. Revival, Musical: Follies, Stephen Sondheim. Actor, Play: Brian Cranston, Network , adapted by Lee Hall (Billy Elliott). 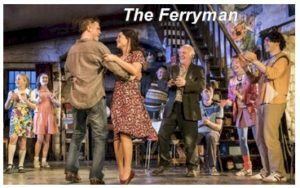 Actress, Play: Laura Donnelly, The Ferryman. Actor, Supporting, Play: Bertie Carve, Ink [by James Graham, about mogul Rupert Murdoch]. 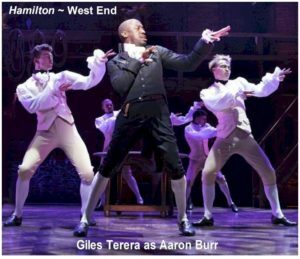 Actor, Musical: Giles Terera (Aaron Burr), Hamilton. Actress, Musical: Shirley Henderson, Girl from the North Country [Conor McPherson’s musical, scheduled to come to Broadway, is based on the work of Bob Dylan; with book and lyrics by Tom Eyen and music Henry Krieger, Dreamgirls]. 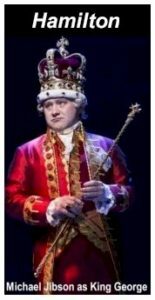 Actor, Supporting, Musical: Michael Jibson (King George III), Hamilton. Actress, Supporting, Musical: Sheila Atim, Girl from the North Country. Presenters this year included Cuba Gooding Jr., Andrew Lloyd Webber, Patti LuPone, Chita Rivera, Michael Sheen, and Juliet Stevenson. Among U.S. shows nominated were Oslo, An American in Paris, Five Guys Named Moe, 42nd Street, Who’s Afraid of Virginia Woolf, and Young Frankenstein. Performances from nominated musicals included: Hamilton; Everybody’s Talking About Jamie; Girl from the North Country, Young Frankenstein, Follies and 42nd Street. Ms. Rivera, Andy Karl (2017 Olivier, Actor, Musical, Groundhog Day), and Adam J. Bernard (2017 Olivier, Actor, Supporting, Dreamgirls) performed West Side Story’s “Somewhere” for the In Memoriam segment. A special 50th anniversary honor went to Tim Rice and Lloyd Webber’s Joseph and The Amazing Technicolor Dreamcoat with past stars including Jason Donovan and Linzi Hateley. Sheen introduced the In Memoriam segment. Among those remembered and known here were: Hywel Bennett (film/TV actor, Loot, Tinker Taylor Soldier Spy, Eastenders, Pennies from Heaven, Shelley), David Cassidy, Barbara Cook, Bruce Forsyth (legendary Brit actor/comedian/singer/dancer), Peter Hall, Thomas Meehan, Roger Moore, Bernard Pomerrance [playwright, The Elephant Man), Sam Shepard, and Stuart Thompson (six-time Tony-winning producer).